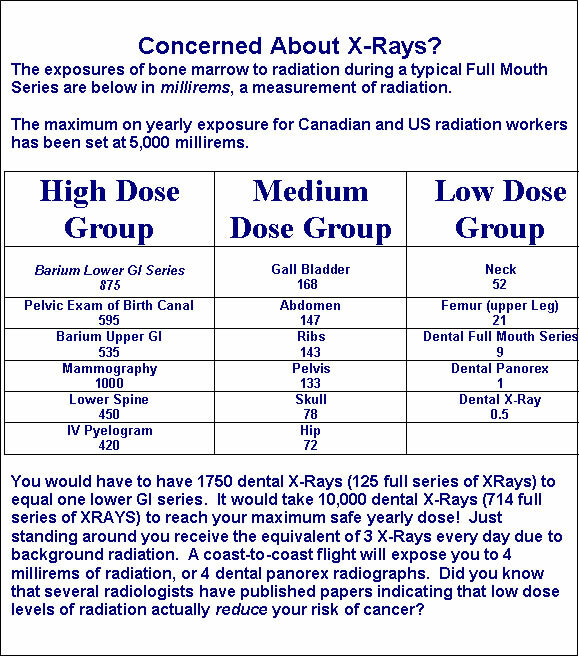 X-Rays allow examination of areas that cannot be seen any other way. 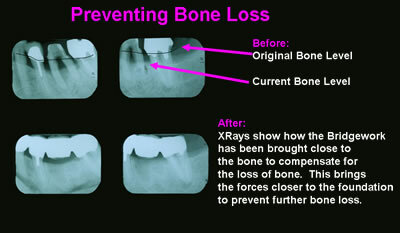 A periodic full series of Dental X-Rays (every 2 years) can prevent needless trouble and expense. Periodontal disease and cavities are often painless, and there may be no warning signs. A minor problem can turn into a serious one in a short time–early detection is critical. Sometimes X-Rays can point to a systemic condition like diabetes, heart disease or cancer. Periodic X-Ray examination could save your life! Decay shows up on X-Rays as a dark area. The decay under these crowns extended into the nerve channel in the center of the tooth (pulp). When the nerve dies, the decomposed tissue leaks out the end of the root and causes bone loss. A dark area (bone loss) can easily be seen around the end of one of the roots. These teeth were saved with root canal therapy (Fig. 2) and new crowns (Fig. 3) Note how the the area around the root has healed.